The Nobel Prize winning poet earned many fans back in the folk era which was ending about 1966-67. There were, of course, all the famous early songs like “Blowin’ in the Wind”and “The Times They Are-A-Changing”. Many of those songs were protest songs and then he began to write personal songs like those on Another Side of Bob Dylan, followed by “Mr. Tambourine Man” (made into a top 40 hit by The Byrds) and top 40 songs such as “Like a Rolling Stone” (which remains his biggest radio hit). With these ‘plugged in’ songs, he was credited, single-handedly, with launching the whole folk-rock era. Arguably, this high period was based on three significant best-selling albums in a row: Bringing It All Back Home, Highway 61 Revisited, and the double album Blonde on Blonde. 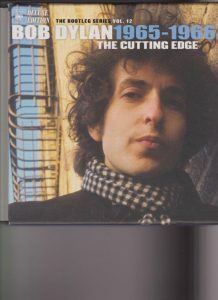 The bootleg 6 disc box with illustrated book, pictured above, is a treasure trove of Dylan process in making these three albums. It shows how the many songs evolved through many takes; the numbers featured here range from one to 20 takes (the latter of “Like a Rolling Stone”, certainly the centerpiece of this 3-LP core from this time period). Also included are other tunes that perished quickly (“You Don’t Have to Do That”, “California”, “Sitting on a Barbed-Wire Fence”, “Medicine Sunday”, “Jet Pilot”, “I Wanna Be Your Lover”, and “Lunatic Princess”or that were recorded by others such as “If You Gotta Go, Go Now–Manfred Mann). Various versions of his top 40 songs “Positively 4th Street”,”Can You Please Crawl out Your Window”, “I Want You”, “Just like a Woman”, and “Rainy Day Women #12 and 35” also reveal his hit-making formula of the day. There are many outstanding treats here, too, with the alternate versions of the long songs “Sad-Eyed Lady of the Lowlands” and “Desolation Row”. Myself, I enjoyed hearing “It Takes a Lot to Laugh, It Takes a Train to Cry”, “Like a Rolling Stone”, “Visions of Johanna”, and “Stuck inside of Mobile with the Memphis Blues Again”, chugging toward their final forms on the original albums. The one take of “Rainy Day Women” is very funny and among the more delightful highlights. BTW/the accompanying photo book called Mixing up the Medicine is a nice visual companion. Another book containing the discs has notes on each of the three albums, followed by notes for each take on the discs. All that a Dylan listener could want to make better sense of the goings-on at the rehearsals. As a poet and musician, I appreciated these rare, unexpected glimpses into how Dylan worked in the studio at the time and how these songs went through processes with many intriguing twists and turns on their way to ‘finality’. Overall, this deluxe offering is fun, entertaining, informative, and creatively illuminating. The changes in music and lyric choices are highly instructive for poets, songwriters, musicians, and recording studio types alike. 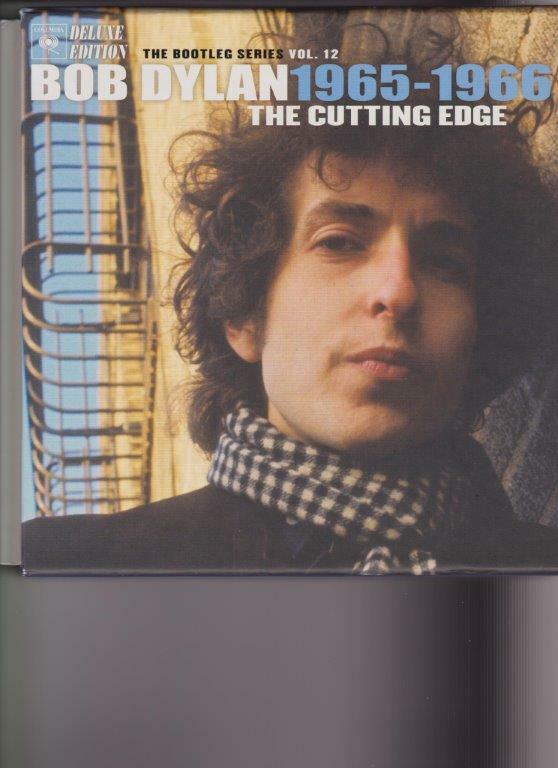 Two thumbs way up for this one, especially serious Dylan fans.